My dad had shoulder replacement surgery on late last month. The day he had surgery, was the day that we got A LOT of snow. So much snow that, my parents had to go to the hospital early to beat the snow. So much snow that, my sister and I could not get to the hospital. So much snow, that my mom had to stay at the hospital with my dad, because the road were bad. So much snow that my uncle had to go to the hospital two days after the surgery, to drive my mom home. Thank you Uncle Bob! The surgery was a success...but the recovery has been hard on him. My daddy is a tough man. He has survived a car crash that should have killed him, knee replacement, a terrifying intestinal problem last year that scared us all, and raising my sister and I, which I know caused him an ulcer or two. He is way past the age of retirement, but still works almost full time. He is an wonderful father, husband, Papa, and friend. But this surgery...this has knocked him, and knocked him hard. Seeing my dad in pain, and my mom hurting because he is hurting, well, it is not a good feeling. I wanted to make his favorite treat, raw cookie dough. Every time we make chocolate chip cookies, we HAVE to save him a bowl of raw dough to eat. But...well...with the concern of him eating raw eggs, I decided to make him an egg less version. I have never made one like this before...but OMG...I will be making it again! It comes together very quickly, is rich and sweet and just yummy! You can use any type of chip you want. I made three different batches, using chocolate chips, mini M&Ms and chocolate toffee bits. Confession time, the chocolate toffee bits one was so good.....I kept it for myself. I gave the other two to my daddy, and he loves it. I think using only brown sugar really help give it a rich and full flavor of regular egg cookie dough. The amount of milk needed to make this is really a personal preference, if you like a thinner dough, use more milk, a thicker dough, use less milk. I like my dough THICK so I just used 2 tablespoons of milk. I also found that melting the butter, allowed the dough to come together quickly, and since it will not be baked, using melted butter does not matter, like it would with a baked cookie. If you love eating cookie dough, right out of the bowl while making cookies...this one is for you. Cream butter and sugar. Stir in vanilla and 2 tablespoons of milk. Mix in salt and flour, add more milk if needed. Gently Stir in chips. Enjoy. Store leftovers in refrigerator. 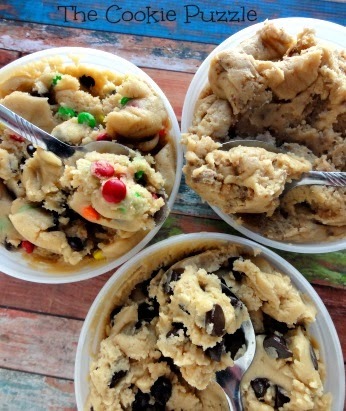 Your cookie dough is sure to make your daddy feel better! Here's to a speedy recovery Grandpa Puzzle! Thank you Nikki! It was a huge hit...in fact....I need to make some more! I will pass your well wishes on to him...bless you! It's so hard to be stuck outside the home during a snow storm! I bet the cookie dough really cheered your dad up! I love eating raw cookie dough! Wow, this looks sooo good! I love cookie dough! I think the toffee chip one would be my favorite too! You are such an awesome daughter for making your dad a special treat! Wishing your dad a speedy recovery! Just booked marked your recipe, what a great idea going eggless. Thank you for sharing it on our Four Seasons Blog Hop. Pinning Now. This is AMAZING! 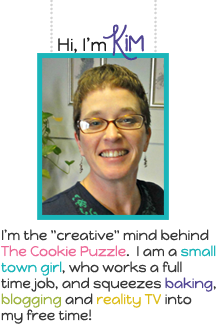 Thank you for sharing at Time For Mom! I'm sorry about your dad! That's so hard to see a loved one in pain. I hope he recovers soon! This cookie dough?? Amazing. 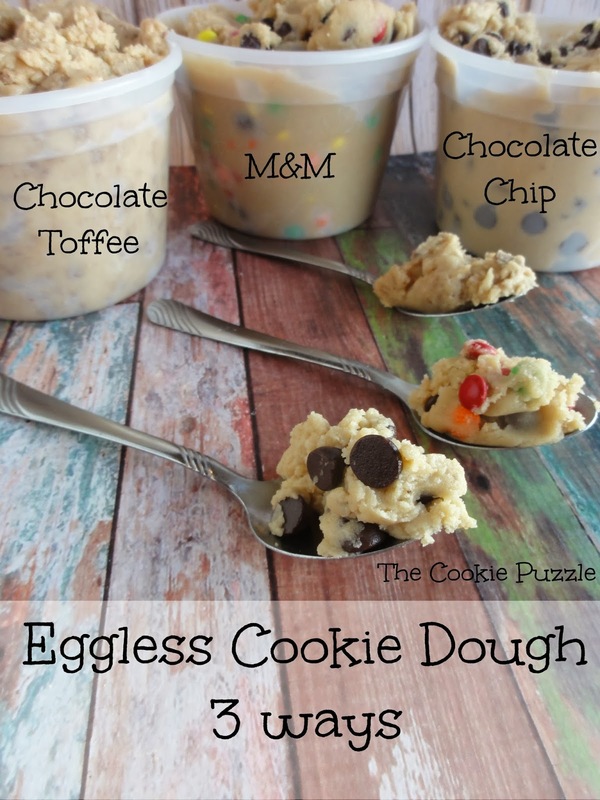 I love eating the raw cookie dough when I'm making cookies so I can't wait to try this eggless version! Thanks for linking up to Saturday Night Fever - pinned! I wonder if this would be "okay" to eat pregnant. I really want some cookie dough! Of course it is safe to eat Sarah..it is eggless...meant for eating by the spoonful. Congratulations on your pregnancy, may you have a happy and healthy experience. I would cook the flour first though. Raw flour is not safe to eat. What would you recommend as a substitute for the flour? I have a gluten allergy. Hooray for eggless cookie dough! How nice of you to make it for your dad....so thoughtful! I will definitely be making this for myself soon!!! Thank you so much for this recipe! I just made it and it taste amazing! I made double the amount so I can share with everyone, and I know they'll love it just as much as I do. Thanks again! I am glad you enjoyed it, it is yummy and I love that it is so easy to make. Thank you for stopping by. Oh I bet this would be wonderful added to ice cream. :) I must try all of them alone and then try adding to ice cream. Thank you for sharing the recipe. Adding it to Ice Cream?! Why didn't I think of that? AMAZING idea! Thank you for stopping by. Just made this, it's so good! And everyone at my house loves it! I am glad you enjoyed it Karlie. I never can stop eating it when I make it, so I don't make it as often as I want to. Thank you so much for stopping by...have a blessed week. These look amazingly yummy! I have such a sweet tooth and I'm loving this. I just pinned. Stopping in from Cook It, Craft It, Share It. I hope you enjoy the rest of your week. I can't wait to try these! OMG . . . my coworker friend brought me in some to work today and it is AWESOME . . . but one question . . . can you bake this stuff too? I love eating cookie dough! But you're right that raw eggs are a concern. Thanks for the recipe. It might be dangerous for me to have this recipe!! I'm like your dad, and love the dough almost more than the baked cookies! I'm so glad you linked up with us again this week at Your Turn To Shine, Kim! Wishing your family all the best during this difficult time. Hopefully the cookie dough sweetens the atmosphere. I know I will be giving this recipe a try for sure so great job! Blessings to your dad and I have to believe this cookie dough would help anyone feel better! This sound so delicious and so dangerous, I could eat these in a matter of minutes! Wow! So glad I found you via the Party in Your PJs! This is a perfect dip/dessert for my future son-in-law who has an intolerance for eggs but a LOVE for cookie dough! Thank you!